The Cooler Master DP5-K11 is the first "heatpipe" cooler available on the retail market. What is a heatpipe cooler? Explained in simple words: a heatpipe is a tube filled with a liquid, which transports heat by evaporating on the hot side, and condensing on the cooled side. 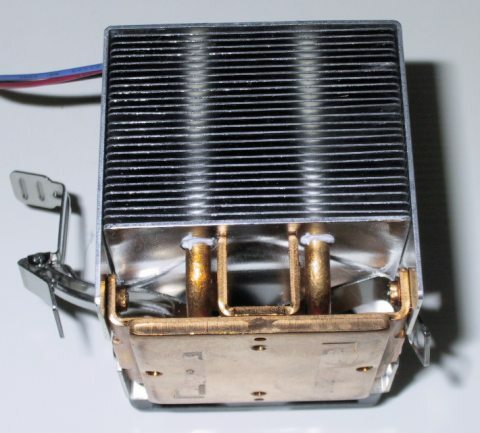 Unlike Peltier elements, heatpipes do not require any electricity to work. The heatpipe technology itself isn't new; heatpipes are being used in the air conditioning systems of some airplanes. Also, the Sega Dreamcast game console, and the first 1GHz P3 PCs from Dell are cooled using heatpipes. The DP5-5K11 looks almost like a conventional cooler. You can see the ends of the heatpipe sticking out of the cooler. A closer look at the heatpipe. The entire base and the heatpipe itself are made of copper, the cooling fins are made of aluminum. The heatpipe technology is certainly interesting - but what limits the DP5-5K11's cooling performance is its small size and the fact that it is equiped only with a 50x10mm fan. The performance of this cooler was very disappointing - especially considering the price. Other sites have reviewed Cooler Master's heatpipe cooler with better results. Why? 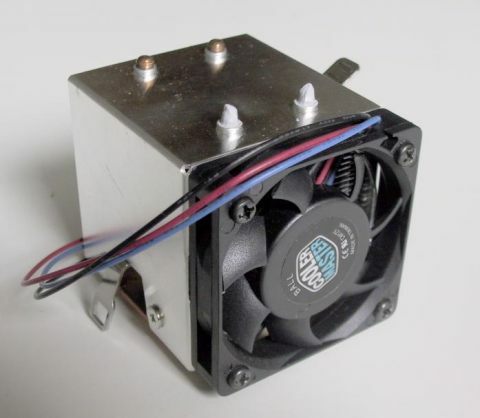 The performance of a cooler equiped with a heat pipe depends very much on its operating conditions. Heat pipes can transport only a certain amount of heat; therefore this cooler might perform better when used with a CPU with a lower power dissipation than our test CPU. Also, we always test with a closed case. Because of the high power dissipation of the CPU and the GeForce1 card, the case temperature in our test setup was relatively high, which might limit the cooler's performance. So, under other conditions, the cooler might perform better, but it certainly couldn't convince in our test system. Coolermaster's heatpipe cooler comes with a pretty easy to install clip. Because of the small size of the cooler, there aren't any problems with motherboard compability.